2019 CSA Registration is open! Sign up today! Announcing the 2019 CSA Share! Farmer Dave's CSA makes it easy to enjoy locally grown, farm-fresh produce every week – hand-picked, packed and delivered to a central location for your convenience. The Lawrence CSA program is run by Farmer Dave, who uses 50 Island St (Entry B) as a pickup location each Tuesday throughout the season. Please go to Farmer Dave's website to sign up for a 2019 share! By signing up for a share, you will receive weekly access to high quality, fresh, locally-grown produce. There are multiple share options ranging from fruit shares to pre-boxed or choice-style vegetable shares, so you can choose whichever suits your lifestyle best. At GWL we aim to make fresh, healthy food available to everyone in the community, so we established a fund to subsidize the cost of fresh food including CSA shares, farmers market coupons and SNAP matching funds, for individuals and families experiencing financial hardship. Please consider donating to the program. 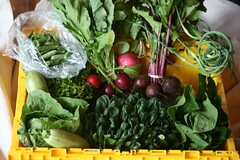 Why participate in a CSA? Access to high quality, fresh, locally-grown produce that tastes better! Convinced? Sign up today on Farmer Dave's website! Farmer Dave was raised on Marsh Hill in Dracut, Massachusetts. He grew up working on the Brox Farm in Dracut learning the intricacies of New England farming from John Brox who had been tilling that land since the 1920s. After graduating from college Farmer Dave served in the Peace Corps as a crop extensionist in Ecuador.Upon returning, he leased Brox Farmand began growing a wider and wider array of fruits, vegetables and flowers.In 2003 he was asked to offer his fresh products to a neighboring community and began also leasing the East Street Farm in Tewksbury. Working closely with those trying to preserve farmland for future agriculture, in 2006 he finally purchased his own farm in Dracut from the Leczynski family. This became known as Farmer Dave’s Dumaresq Farm, or simply “Farmer Dave’s.” Then, when GWL sought to start a local CSA program, a partnership formed and Farmer Dave's CSA came to Lawrence. Since his first days in farming, Farmer Dave has been exploring methods of better farming. Sometimes these methods may be new, sometimes they may be ancient ways that need only be rediscovered, or old methods using modern equipment. Farmer Dave sees his role as feeding his community in the best way possible.His growing methods are guided by the National Organic Standards and by his goals of achieving a sustainable system.